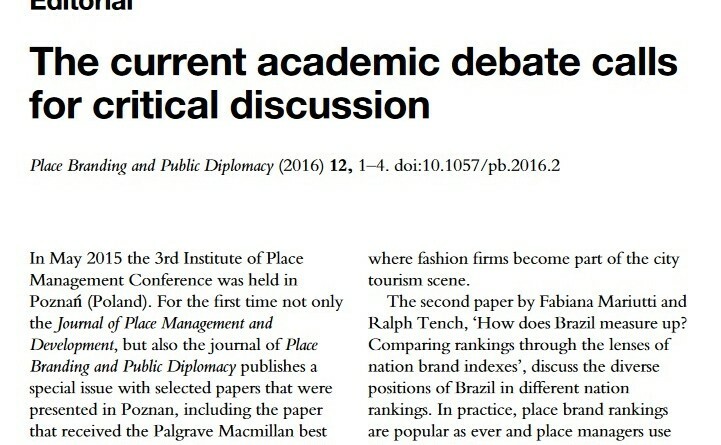 The latest issue of academic journal Place Branding & Public Diplomacy (published by Palgrave Macmillan) is dedicated to the Place Management & Branding Conference which took place in Poznan, Poland, during May 6–8, 2015. In the issue’s editorial, Robert Govers and Sebastian Zenker call for a critical discussion to further the academic debate on place branding. This call for more academic rigor comes at a time of drastic changes in how places – especially destinations – are promoted: A time where place branding – understood as the process of place making, brand development, management and communication – is well positioned to becoming the supporting framework of PBMOs [Place Brand Management Organizations]. Below extracts of the editorial, followed by some thoughts. Govers & Zenker: Last year’s meeting of international researchers and practitioners is also the right moment to critically question the field of study. Even though our first meta-analyses of the place branding literature (Gertner, 2011; Lucarelli and Berg, 2011; Lucarelli and Brorström, 2013) highlight the exponential growth in contributions, they also criticize the lack of theoretical and conceptual background of our articles. This lack of scientific rigor is surprising, as place researchers have the opportunity to borrow numerous concepts and theories from many different disciplines. Unfortunately, there has been limited work on translating current knowledge from other disciplines for use in our field and consequently, we are sometimes stuck at the same level of discussion. As a discipline we have to admit that our field under-performs in the areas of academic rigor and theory development. Other disciplines improved their empirical and theoretical skills and raised the bar for publications. For example, while single case studies remain common in place branding, they would be considered substandard by high-ranking marketing journals. Such journals look for empirical results underpinned by a solid theoretical foundation and for more generalizability than can be derived from practitioner problems in any one particular place. In place branding in general, and in the Place Branding and Public Diplomacy journal in particular, we are proud of our close link between the practical and academic spheres. However, we often forget about the need to improve general knowledge and further develop place branding as an academic field. Dozens of single case studies with only very case specific results and poor theoretical conceptualization are not providing enough contribution in this regards. Linking cases to theoretical knowledge and deriving general learnings by comparing and contrasting multiple cases is key. In fairness, the academic discussion has improved in recent years. In early place branding publications scholars and others focused extensively on phraseology, definitions and awareness raising. Today, the common knowledge about the subject is growing. This growth has led place branding to become this highly interdisciplinary topic that it is today. While valuable, this development presents a particular challenge, as researchers and practitioners from different disciplines do not necessarily speak the same language. Unsurprisingly, then, many contemporary articles do not use up-to-date definitions of place branding (for example, still misunderstanding it as a limited approach to place promotion) and there is still insufficient insight and agreement with regards to the distinctiveness, overlaps and linkages between: public diplomacy and place branding; place marketing and place branding; destination branding and place branding; place management and place branding or place making and place branding. We, as academic community should enhance our understanding and defend our field more thoroughly in this regards. Some have asked whether place branding is worth the effort (Medway et al, 2015). If, in practice, nobody really owns the brand and policymakers lack the power to really influence it, then why should anyone care? If successes are hard to measure, but policymakers demand hard numbers to prove the effective investment of public and private resources, then why should we try? If results are hard to publish because of the field’s interdisciplinary background and low academic reputation, then why should we suffer? Because it is worth it. The field is one of the few final frontiers, where we have the chance to combine theories from all our disciplines. It is an area where researchers and practitioners can still help one another in pursuit of a common goal – making places better. It is not a simple or easy undertaking, but we are convinced that place branding can be applied to help places become more meaningful and satisfying to the people who use them. Thus, place branding is not a waste of time, but a great field of research with practical utility – as long as we are willing to push us beyond our comfort zones. Science should be a domain for discussion and development, but this is only possible if we work hard to maintain an atmosphere of debate. While there are sometimes unavoidable politics involved in academic publishing (such as referencing everybody to please potential reviewers or ignoring poor academic work to not displease anyone), it is important that these do not impede the discussion, and sometimes conflict, that is necessary for scientific advancement. Only by engaging in critical and constructive debate can we improve our field of research. Place branding is a bit like sustainability – a concept intended to incorporate many disciplines and viewpoints which traditionally stand in conflict with each other. Just like sustainability has gone from niche ‘nerd’ concept to mainstream business strategy, place branding will – eventually – end up being embraced by place developers, managers and promoters. And just like sustainability, in the place branding field more can sometimes be achieved by pressing forward the agenda without focusing on the term (which is still confusing to many, especially practitioners). The very purpose of The Place Brand Observer is to promote best practice and to help practitioners understand what really matters in relation to the branding and reputation of places. Place branding (understood holistically) as master strategy is a unique opportunity for struggling economic developers and destination marketers, who are witnessing a paradigm shift from place marketing/promotion (one to many) to creating and managing a place brand based on stories of people, told by influencers through digital channels – often beyond their immediate control. The Place Brand Observer has teamed up with academic publisher Palgrave to share with you key insights and findings from articles published in their quarterly flagship journal, Place Branding and Public Diplomacy, edited by Robert Govers and Nick Cull. Liked this post on the current state of place branding research and the way ahead? Please share!